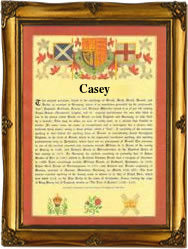 This interesting name, with variant spelling O'Casey, is an Anglicized form of the Old Gaelic "O'Cathasaigh", from the Gaelic prefix "O" indicating "male descendant of", plus the personal byname "Cathasach", meaning vigilant or watchful. Traditionally, Irish family names are taken from the heads of tribes, revered elders, or from some illustrious warrior, and are usually prefixed by "O", as above, or "Mac", denoting "son of". Six distinct septs of this name existed in Ireland: the most important of these in early times were erenaghs of Devenish, County Fermanagh, where the family held church property from generation to generation. A minor sept having the prefix "Mac", instead of "O", was located in County Monaghan, and three bishops named Mac Casey occupied the see of Clogher in the 14th Century. Another leading O'Casey family were Lords of the Suaithni (comprising the modern barony of Balrothery West, County Dublin), and a further family were erenaghs of Clondara in the barony of Athlone, County Roscommon. The Dalcassian septs were seated at Liscannon, County Limerick, and near Mitchelstown, County Cork; the name is now most numerous in these Munster counties. John Keegan Casey (1846 - 1870) was a Fenian and Gaelic poet. The first recorded spelling of the family name is shown to be that of Johane Casey, which was dated April 18th 1569, marriage to Thomas Nowell, at St. Gregory by St. Paul's, London, during the reign of Queen Elizabeth 1, known as "Good Queen Bess", 1558 - 1603. Surnames became necessary when governments introduced personal taxation. In England this was known as Poll Tax. Throughout the centuries, surnames in every country have continued to "develop" often leading to astonishing variants of the original spelling.